Best Western Rewards has resurrected the Internet Only Rate offer for stays this fall. Best Western Rewards members can earn 1,000 bonus points and Elite members 1,500 bonus points for booking this rate plan. This offer (FALL13) is valid for bookings made between September 16 and November 24, 2013, for stays until November 25. You don’t have to register to receive the 20% discount but you must to get the bonus points. You can register for this promotion by logging to your Best Western Rewards account and then clicking “Register For Special Offers” tab. This offer is valid for Best Western Rewards members in United States, Canada, USVI and the Bahamas. There can be other Best Western promotions this fall, as this offer is restricted to those that book and pay this specific rate plan. Guests who book a reservation on bestwestern.com** at the Internet Only rate plan between September 16, 2013, and November 24, 2013 (Promotion Period), for a stay commencing during the Promotion Period will receive up to a 20% discount off the Best Available Rate. Promotion registration is not required to receive the Internet Only discounted rate. Discounted Internet Only rate is available only at participating hotels. Discounts will vary by hotel up to 20%. The individual hotel?s reservation cancellation and modification policies will apply and may vary by hotel. Additionally, Best Western Rewards members (Member(s)) residing in the U.S., Canada, the Bahamas, or the U.S. Virgin Islands who (a) book a reservation for a qualifying stay* during the Promotion Period on bestwestern.com**; (b) provide their Best Western Rewards account number at the time of booking; (c) register for the Promotion prior to the qualifying stay; and (d) complete the qualifying stay during the Promotion Period will earn 1,000 bonus Best Western Rewards points. Members residing outside one of the participating countries (for list of participating countries, visit www.bestwestern.com) who (w) book a reservation for a qualifying stay* during the Promotion Period on bestwestern.com**; (x) provide their Best Western Rewards account number at the time of booking; (y) register for the Promotion prior to the qualifying stay; and (z) complete the qualifying stay at a Best Western branded hotel in a participating country? during the Promotion Period will earn 1,000 bonus Best Western Rewards points. Elite Members who register for the Promotion prior to booking will receive an additional 500 bonus points for each qualifying stay. Best Western Rewards enrollment is required prior to booking. Best Western Rewards enrollment can be completed by visiting bestwesternrewards.com. There is no limit to the number of Internet Only discounts and booking bonuses a guest can receive during the Promotion Period. These offers may not be able to be combined with certain other offers, promotions, or discounts. Promotion is subject to cancellation or change without notice. Allow six weeks after the completed qualifying stay for posting of the Best Western Rewards bonus points. A qualifying stay for the purpose of this Promotion is defined as one or more consecutive nights at the same Best Western branded hotel at a rate eligible for earning points or airline/partner rewards through Best Western Rewards. Only one check-in/check-out permitted per qualifying stay. Bookings made on the Best Western International, Inc. mobile website or application will also be eligible for the discounted rate and bonus points offer. All Best Western Rewards program rules apply. 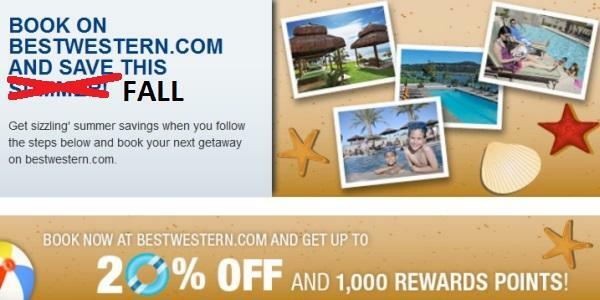 See bestwesternrewards.com for additional program terms. Best Western and the Best Western marks are service marks or registered service marks of Best Western International, Inc. ©2013 Best Western International, Inc. All rights reserved. Each Best Western® branded hotel is independently owned and operated.